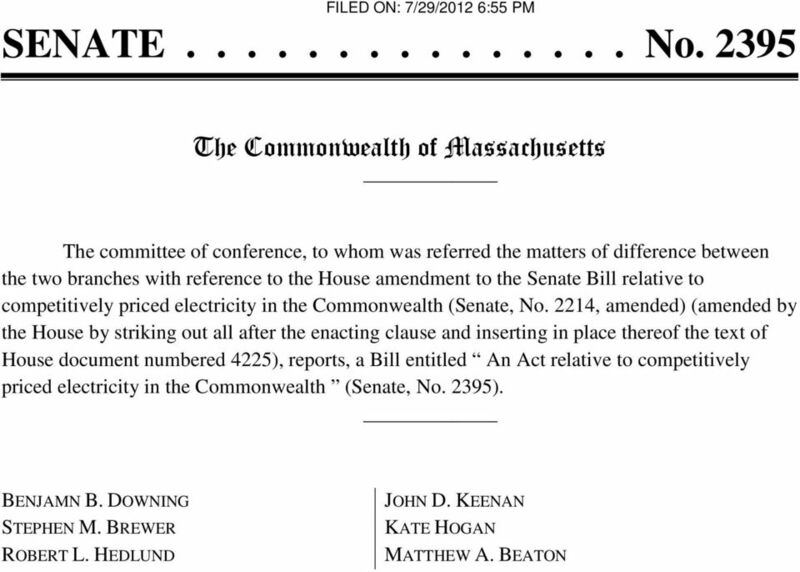 Download "The Commonwealth of Massachusetts"
2 SENATE No Senate, July 30, 2012 The committee of conference, to whom was referred the matters of difference between the two branches with reference to the House amendment to the Senate Bill relative to competitively priced electricity in the Commonwealth (Senate, No. 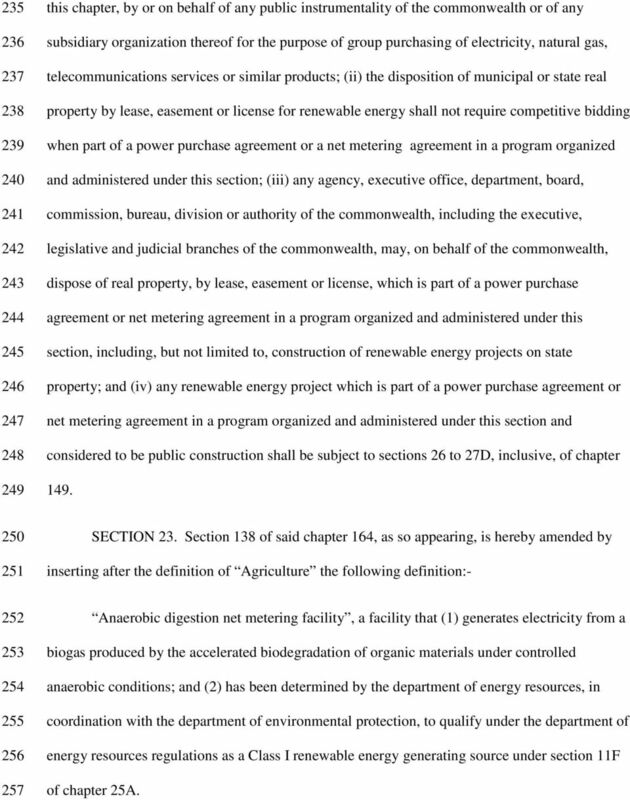 2214, amended) (amended by the House by striking out all after the enacting clause and inserting in place thereof the text of House document numbered 4225), reports, a Bill entitled An Act relative to competitively priced electricity in the Commonwealth (Senate, No. 2395). 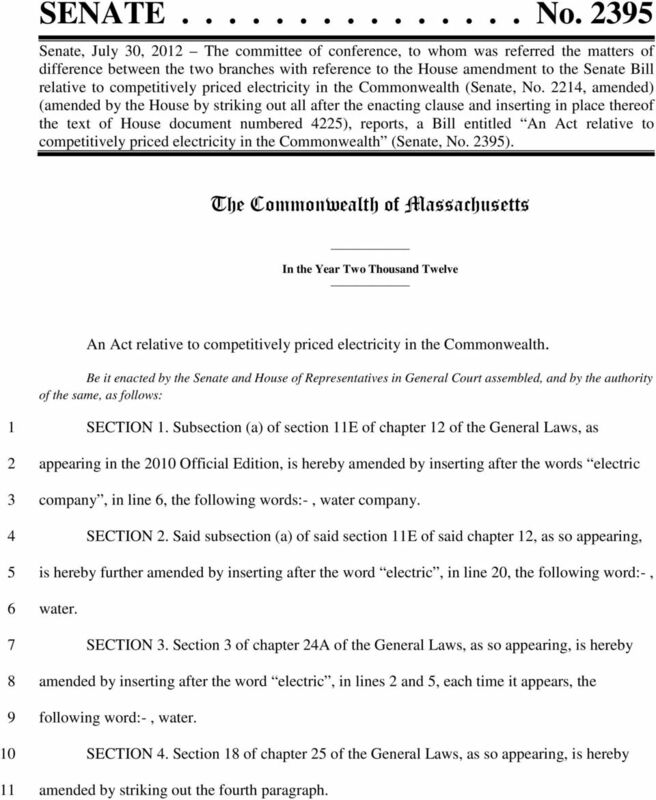 The Commonwealth of Massachusetts In the Year Two Thousand Twelve An Act relative to competitively priced electricity in the Commonwealth. Be it enacted by the Senate and House of Representatives in General Court assembled, and by the authority of the same, as follows: SECTION 1. 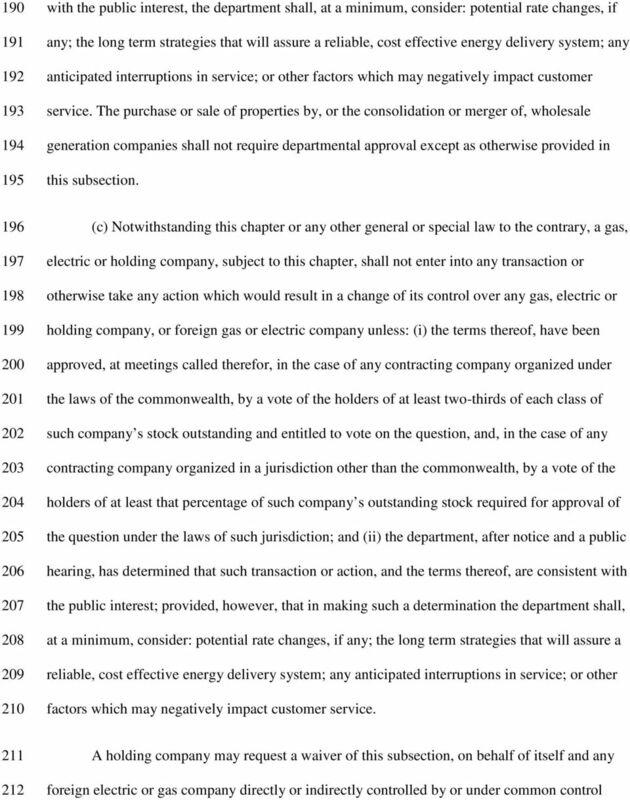 Subsection (a) of section 11E of chapter 12 of the General Laws, as appearing in the 2010 Official Edition, is hereby amended by inserting after the words electric company, in line 6, the following words:-, water company. SECTION 2. Said subsection (a) of said section 11E of said chapter 12, as so appearing, is hereby further amended by inserting after the word electric, in line 20, the following word:-, water. SECTION 3. Section 3 of chapter 24A of the General Laws, as so appearing, is hereby amended by inserting after the word electric, in lines 2 and 5, each time it appears, the following word:-, water. SECTION 4. Section 18 of chapter 25 of the General Laws, as so appearing, is hereby amended by striking out the fourth paragraph. 4 the pilot program. All qualified installations shall be substantially completed by the end of the program, and shall be subject to verification and review by the department. Electric and gas distribution companies shall recalibrate their energy efficiency goals, as reviewed by the energy efficiency advisory council under subsection (c) of said section 21, to reflect the rebates provided to any customer electing to participate in this pilot program. Nothing in this subsection shall be construed to cause a decrease in the funding of the low-income residential demand-side management and education programs funded under this section. 42 SECTION 6. Subsection (d) of said section 19 of said chapter 25 is hereby repealed SECTION 7. 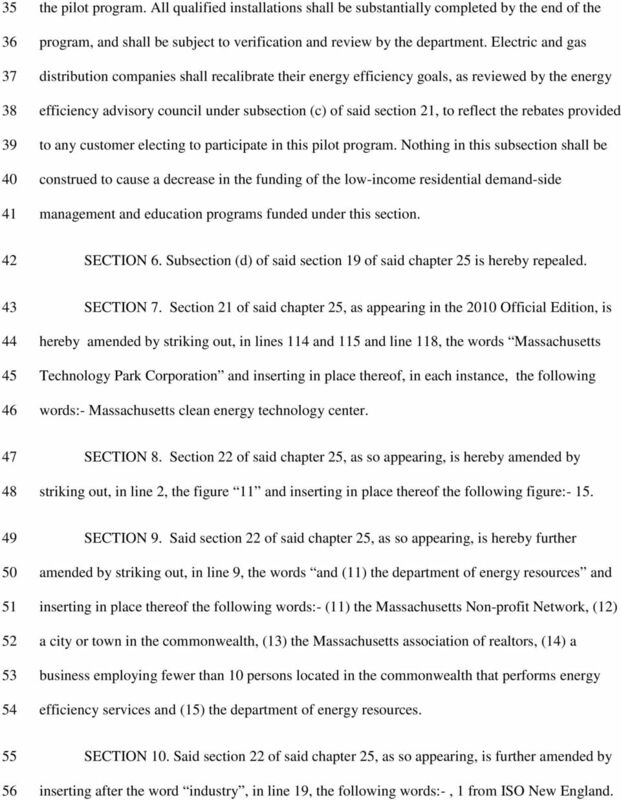 Section 21 of said chapter 25, as appearing in the 2010 Official Edition, is hereby amended by striking out, in lines 114 and 115 and line 118, the words Massachusetts Technology Park Corporation and inserting in place thereof, in each instance, the following words:- Massachusetts clean energy technology center SECTION 8. Section 22 of said chapter 25, as so appearing, is hereby amended by striking out, in line 2, the figure 11 and inserting in place thereof the following figure: SECTION 9. 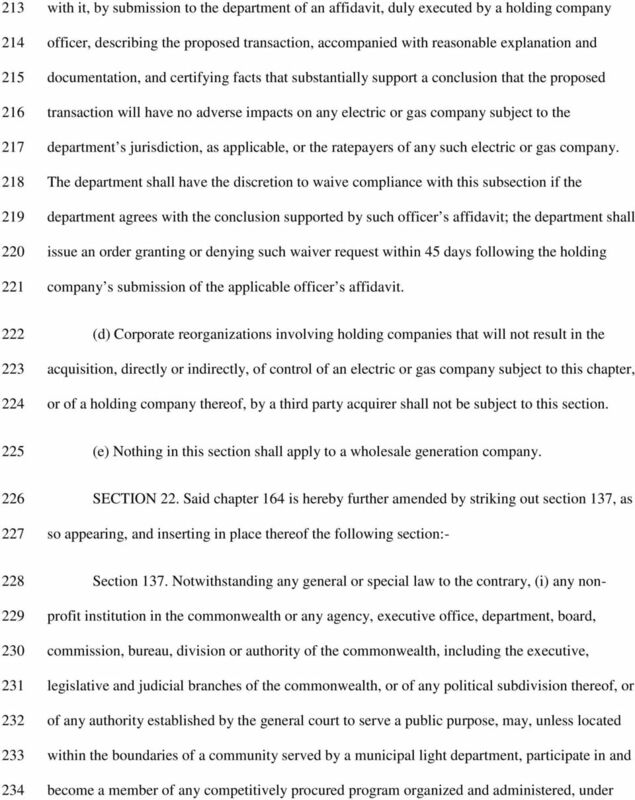 Said section 22 of said chapter 25, as so appearing, is hereby further amended by striking out, in line 9, the words and (11) the department of energy resources and inserting in place thereof the following words:- (11) the Massachusetts Non-profit Network, (12) a city or town in the commonwealth, (13) the Massachusetts association of realtors, (14) a business employing fewer than 10 persons located in the commonwealth that performs energy efficiency services and (15) the department of energy resources SECTION 10. Said section 22 of said chapter 25, as so appearing, is further amended by inserting after the word industry, in line 19, the following words:-, 1 from ISO New England. 5 57 58 SECTION 11. 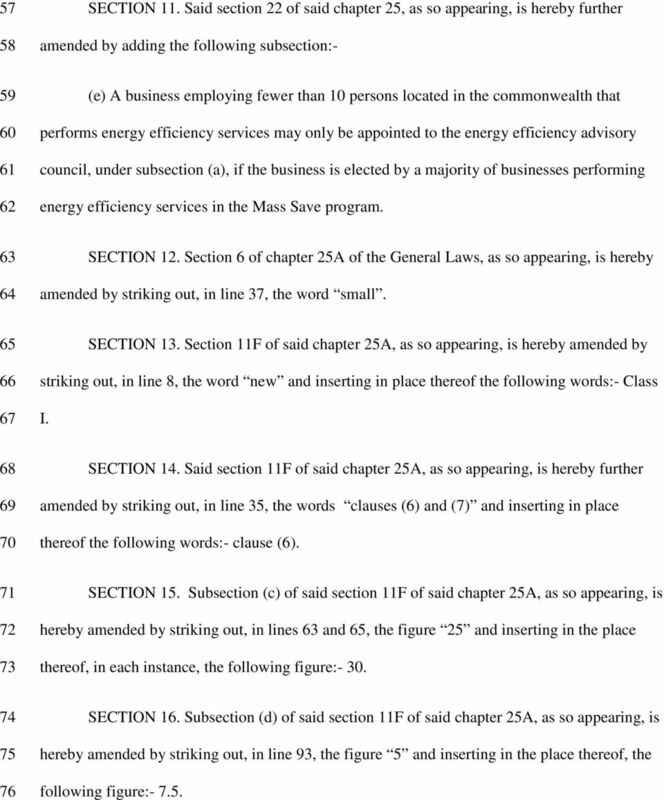 Said section 22 of said chapter 25, as so appearing, is hereby further amended by adding the following subsection: (e) A business employing fewer than 10 persons located in the commonwealth that performs energy efficiency services may only be appointed to the energy efficiency advisory council, under subsection (a), if the business is elected by a majority of businesses performing energy efficiency services in the Mass Save program SECTION 12. Section 6 of chapter 25A of the General Laws, as so appearing, is hereby amended by striking out, in line 37, the word small SECTION 13. Section 11F of said chapter 25A, as so appearing, is hereby amended by striking out, in line 8, the word new and inserting in place thereof the following words:- Class I SECTION 14. Said section 11F of said chapter 25A, as so appearing, is hereby further amended by striking out, in line 35, the words clauses (6) and (7) and inserting in place thereof the following words:- clause (6) SECTION 15. Subsection (c) of said section 11F of said chapter 25A, as so appearing, is hereby amended by striking out, in lines 63 and 65, the figure 25 and inserting in the place thereof, in each instance, the following figure: SECTION 16. Subsection (d) of said section 11F of said chapter 25A, as so appearing, is hereby amended by striking out, in line 93, the figure 5 and inserting in the place thereof, the following figure:- 7.5. 8 such hearing in such local newspapers as the department may select. 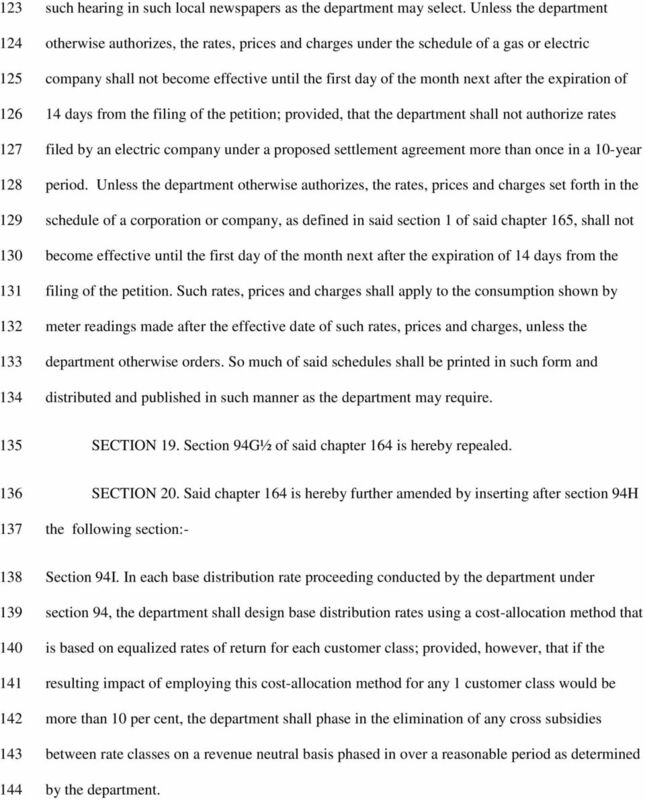 Unless the department otherwise authorizes, the rates, prices and charges under the schedule of a gas or electric company shall not become effective until the first day of the month next after the expiration of 14 days from the filing of the petition; provided, that the department shall not authorize rates filed by an electric company under a proposed settlement agreement more than once in a 10-year period. 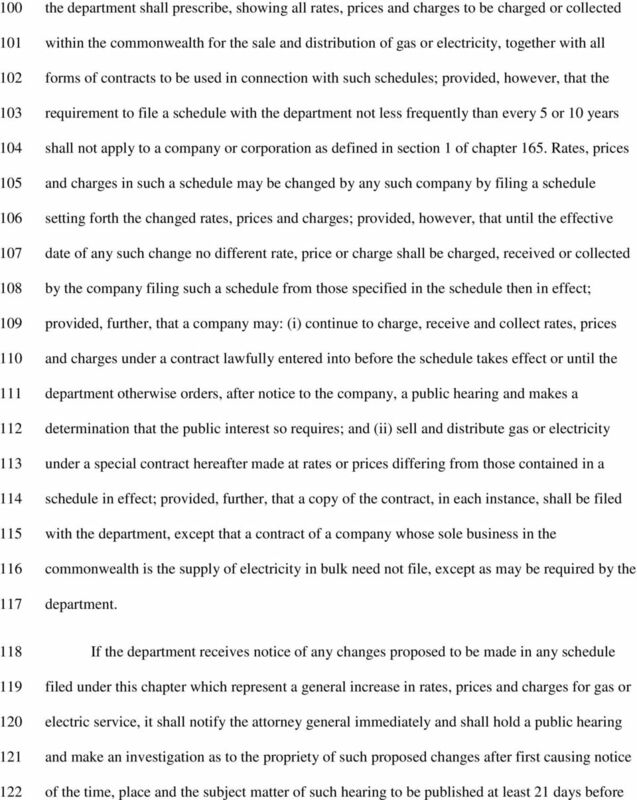 Unless the department otherwise authorizes, the rates, prices and charges set forth in the schedule of a corporation or company, as defined in said section 1 of said chapter 165, shall not become effective until the first day of the month next after the expiration of 14 days from the filing of the petition. Such rates, prices and charges shall apply to the consumption shown by meter readings made after the effective date of such rates, prices and charges, unless the department otherwise orders. So much of said schedules shall be printed in such form and distributed and published in such manner as the department may require. 135 SECTION 19. Section 94G½ of said chapter 164 is hereby repealed SECTION 20. Said chapter 164 is hereby further amended by inserting after section 94H the following section: Section 94I. In each base distribution rate proceeding conducted by the department under section 94, the department shall design base distribution rates using a cost-allocation method that is based on equalized rates of return for each customer class; provided, however, that if the resulting impact of employing this cost-allocation method for any 1 customer class would be more than 10 per cent, the department shall phase in the elimination of any cross subsidies between rate classes on a revenue neutral basis phased in over a reasonable period as determined by the department. 9 SECTION 21. Said chapter 164 is hereby further amended by striking out section 96, as appearing in the 2010 Official Edition, and inserting in place thereof the following section: Section 96. 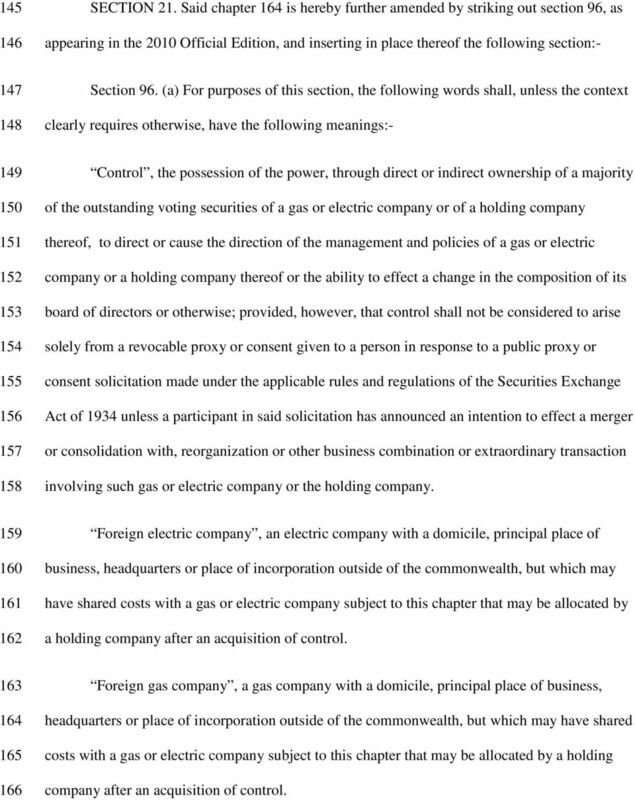 (a) For purposes of this section, the following words shall, unless the context clearly requires otherwise, have the following meanings: Control, the possession of the power, through direct or indirect ownership of a majority of the outstanding voting securities of a gas or electric company or of a holding company thereof, to direct or cause the direction of the management and policies of a gas or electric company or a holding company thereof or the ability to effect a change in the composition of its board of directors or otherwise; provided, however, that control shall not be considered to arise solely from a revocable proxy or consent given to a person in response to a public proxy or consent solicitation made under the applicable rules and regulations of the Securities Exchange Act of 1934 unless a participant in said solicitation has announced an intention to effect a merger or consolidation with, reorganization or other business combination or extraordinary transaction involving such gas or electric company or the holding company Foreign electric company, an electric company with a domicile, principal place of business, headquarters or place of incorporation outside of the commonwealth, but which may have shared costs with a gas or electric company subject to this chapter that may be allocated by a holding company after an acquisition of control Foreign gas company, a gas company with a domicile, principal place of business, headquarters or place of incorporation outside of the commonwealth, but which may have shared costs with a gas or electric company subject to this chapter that may be allocated by a holding company after an acquisition of control. 13 this chapter, by or on behalf of any public instrumentality of the commonwealth or of any subsidiary organization thereof for the purpose of group purchasing of electricity, natural gas, telecommunications services or similar products; (ii) the disposition of municipal or state real property by lease, easement or license for renewable energy shall not require competitive bidding when part of a power purchase agreement or a net metering agreement in a program organized and administered under this section; (iii) any agency, executive office, department, board, commission, bureau, division or authority of the commonwealth, including the executive, legislative and judicial branches of the commonwealth, may, on behalf of the commonwealth, dispose of real property, by lease, easement or license, which is part of a power purchase agreement or net metering agreement in a program organized and administered under this section, including, but not limited to, construction of renewable energy projects on state property; and (iv) any renewable energy project which is part of a power purchase agreement or net metering agreement in a program organized and administered under this section and considered to be public construction shall be subject to sections 26 to 27D, inclusive, of chapter SECTION 23. 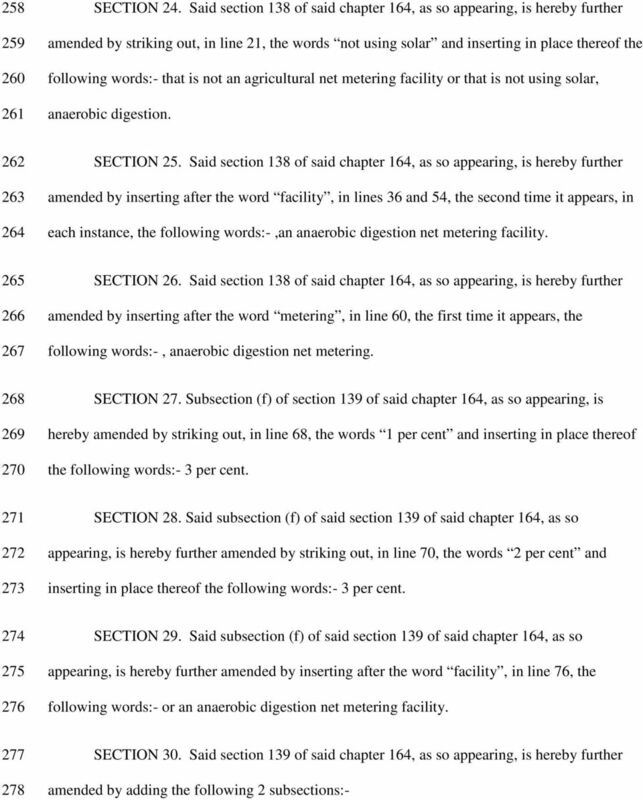 Section 138 of said chapter 164, as so appearing, is hereby amended by inserting after the definition of Agriculture the following definition: Anaerobic digestion net metering facility, a facility that (1) generates electricity from a biogas produced by the accelerated biodegradation of organic materials under controlled anaerobic conditions; and (2) has been determined by the department of energy resources, in coordination with the department of environmental protection, to qualify under the department of energy resources regulations as a Class I renewable energy generating source under section 11F of chapter 25A. 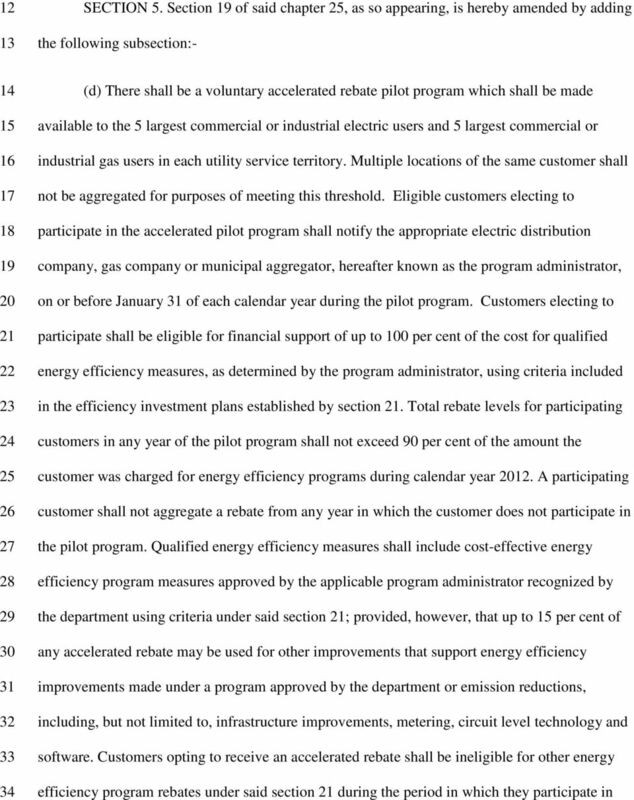 17 of said chapter 25, the department shall review the efficiency investment plan under said section 21 of said chapter 25 and shall not review the plan under subsection (f) SECTION 33. Section 9H of chapter 723 of the acts of 1983 is hereby amended by striking out, in lines 1 and 6, the words quality engineering, and inserting in place thereof, in each instance, the following word:- protection SECTION 34. Said section 9H of said chapter 723 is hereby further amended by inserting after the word recreation, in line 9, the following words:- or renewable energy, notwithstanding any rule or regulation to the contrary, under a permit issued by said department under 310 CMR SECTION 35. 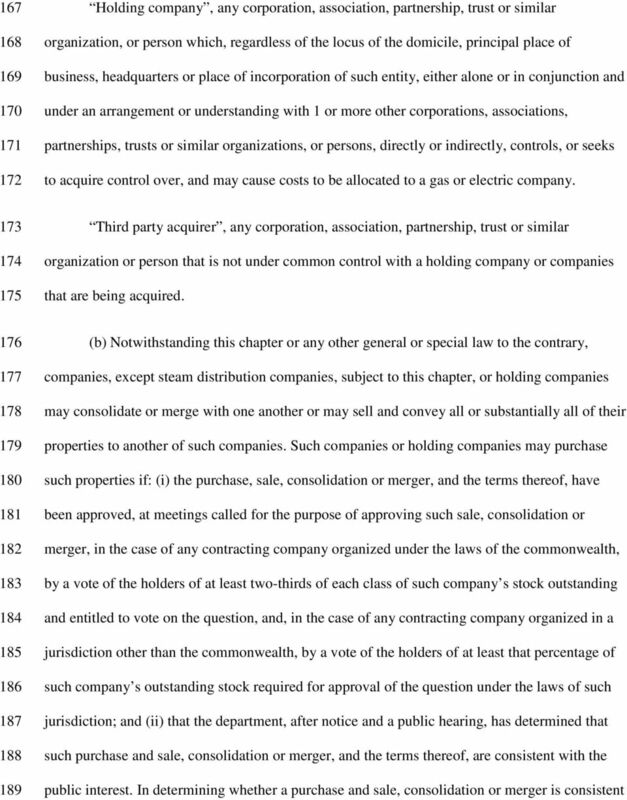 Section 83 of chapter 169 of the acts of 2008 is hereby amended by striking out the first paragraph and inserting in place thereof the following paragraph: Beginning on July 1, 2009 and continuing until December 31, 2012, each distribution company, as defined in section 1 of chapter 164 of the General Laws, shall be required twice to solicit proposals from renewable energy developers and, provided reasonable proposals have been received, enter into cost-effective long-term contracts to facilitate the financing of renewable energy generation. The timetable and method for solicitation and execution of such contracts shall be proposed by the distribution company, in consultation with the department of energy resources, and shall be subject to review and approval by the department of public utilities. This long-term contracting obligation shall be separate and distinct from the electric distribution companies obligation to meet applicable annual renewable portfolio standard, hereinafter referred to as RPS, requirements, under section 11F of chapter 25A of the General Laws. 18 SECTION 36. Said chapter 169 is hereby further amended by inserting after section 83 the following section: Section 83A. 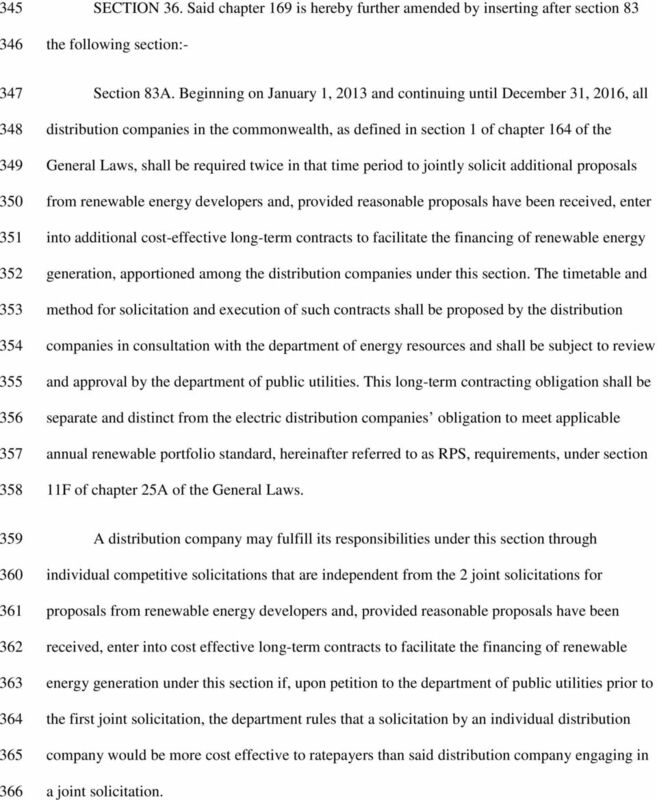 Beginning on January 1, 2013 and continuing until December 31, 2016, all distribution companies in the commonwealth, as defined in section 1 of chapter 164 of the General Laws, shall be required twice in that time period to jointly solicit additional proposals from renewable energy developers and, provided reasonable proposals have been received, enter into additional cost-effective long-term contracts to facilitate the financing of renewable energy generation, apportioned among the distribution companies under this section. The timetable and method for solicitation and execution of such contracts shall be proposed by the distribution companies in consultation with the department of energy resources and shall be subject to review and approval by the department of public utilities. 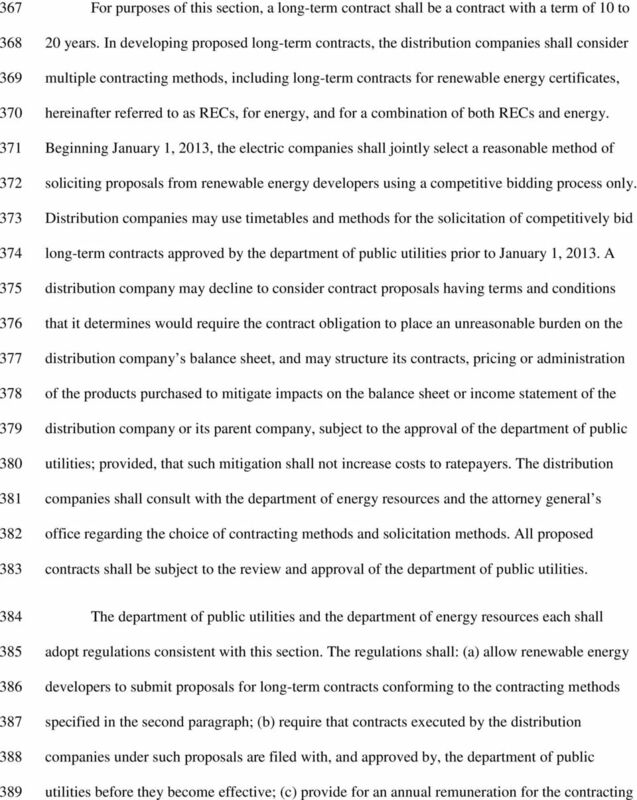 This long-term contracting obligation shall be separate and distinct from the electric distribution companies obligation to meet applicable annual renewable portfolio standard, hereinafter referred to as RPS, requirements, under section 11F of chapter 25A of the General Laws A distribution company may fulfill its responsibilities under this section through individual competitive solicitations that are independent from the 2 joint solicitations for proposals from renewable energy developers and, provided reasonable proposals have been received, enter into cost effective long-term contracts to facilitate the financing of renewable energy generation under this section if, upon petition to the department of public utilities prior to the first joint solicitation, the department rules that a solicitation by an individual distribution company would be more cost effective to ratepayers than said distribution company engaging in a joint solicitation. 20 distribution company equal to 2.75 per cent of the annual payments under the contract to compensate the company for accepting the financial obligation of the long-term contract, such provision to be acted upon by the department of public utilities at the time of contract approval; (d) to the extent there are significant transmission costs included in a bid, the department of public utilities shall authorize the contracting parties to seek recovery of such transmission costs of the project through federal transmission rates, consistent with policies and tariffs of the federal energy regulatory commission, to the extent the department finds such recovery is in the public interest; and (e) require that the renewable energy generating source to be used by a developer under the proposal meet the following criteria: (1) have a commercial operation date, as verified by the department of energy resources, on or after January 1, 2013; (2) be qualified by the department of energy resources as eligible to participate in the RPS program, under said section 11F of said chapter 25A, and to sell RECs under the program; and (3) be determined by the department of public utilities to: (i) provide enhanced electricity reliability within the commonwealth; (ii) contribute to moderating system peak load requirements; (iii) be cost effective to Massachusetts electric ratepayers over the term of the contract; and (iv) where feasible, create additional employment and economic development in the commonwealth. As part of its approval process, the department of public utilities shall consider the attorney general s recommendations, which shall be submitted to the department of public utilities within 45 days following the filing of such contracts with the department of public utilities. 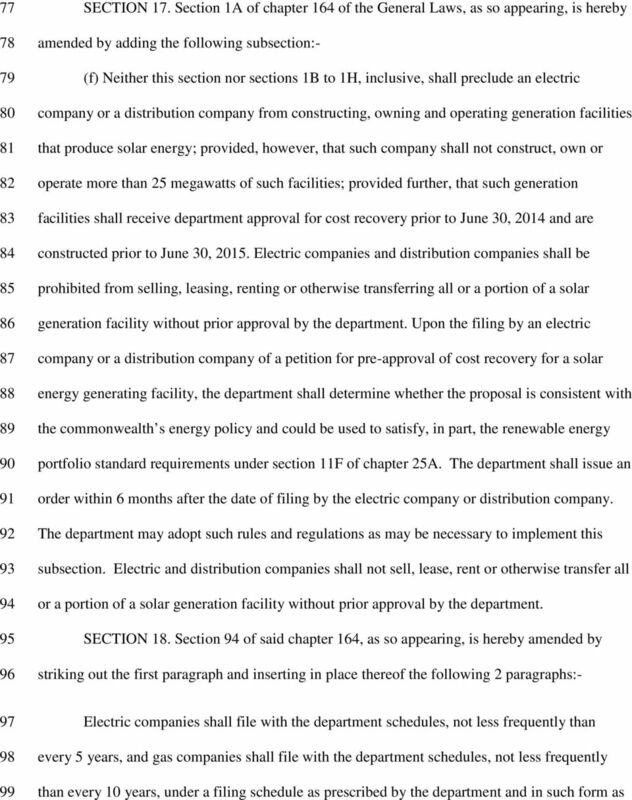 The department of public utilities shall consider both the potential costs and benefits of such contracts and shall approve a contract only upon a finding that it is a cost effective mechanism for procuring low cost renewable energy on a long-term basis taking into account the factors outlined in this section. 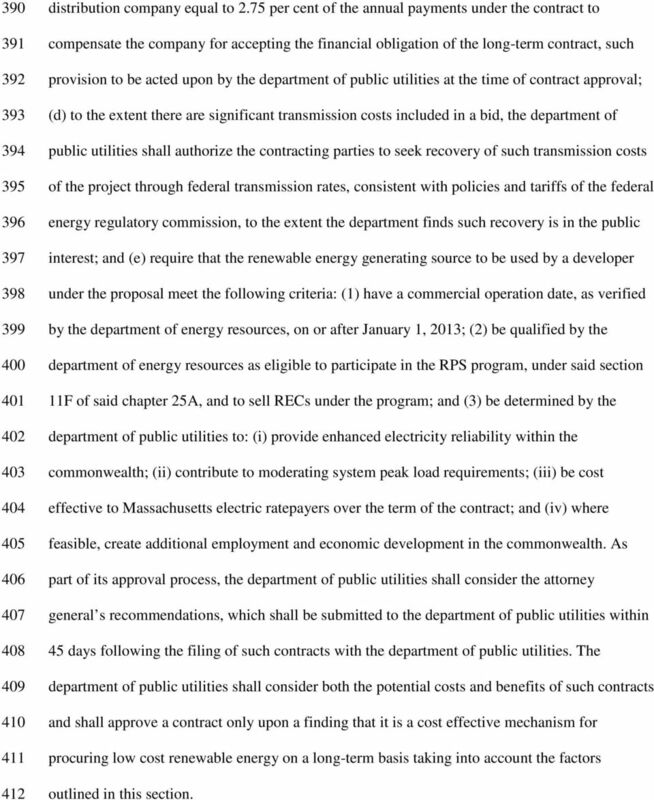 23 contracts already executed and approved by the department of public utilities shall remain in full force and effect This section shall not limit consideration of other contracts for RECs or power submitted by a distribution company for review and approval by the department of public utilities If this section is subject to a judicial challenge, the department of public utilities may suspend the applicability of the challenged provision during the pendency of the judicial action until final resolution of the challenge and any appeals and shall issue such orders and take such other actions as are necessary to ensure that the provisions that are not challenged are implemented expeditiously to achieve the public purposes of this section SECTION 37. Section 114 of said chapter 169 is hereby amended by striking out, in line 3, the figure 2016 and inserting in place thereof the following figure: SECTION 38. 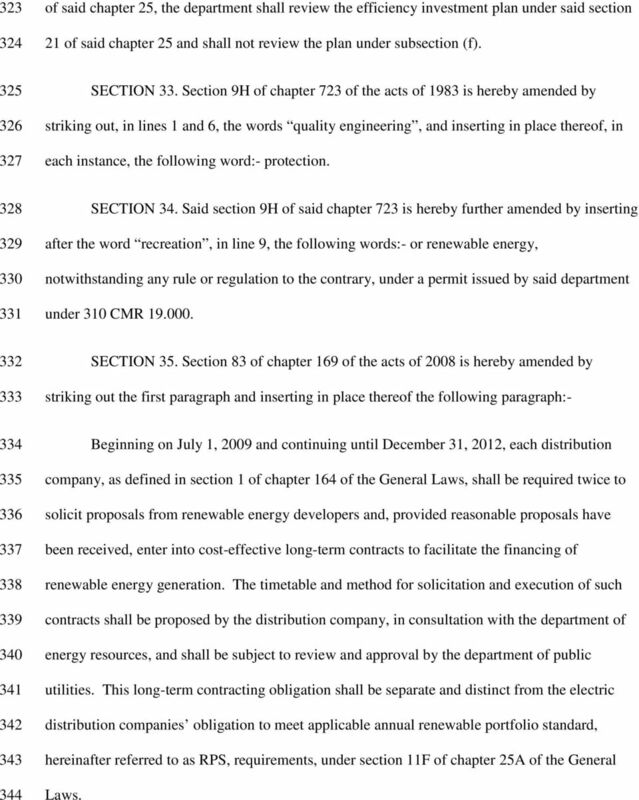 Clause (2) of subsection (a) of section 116 of said chapter 169 is hereby amended by adding the following words:-, including hydroelectric power, regardless of whether that power is eligible under the renewable energy portfolio standard contained in section 11F of chapter 25A of the General Laws SECTION 39. The Massachusetts clean energy technology center shall administer a Hydropower Design and Construction Improvement Grant program, in conjunction with the Commonwealth Hydropower Program, to fund upgrades and improvements to existing hydroelectric generation facilities located in the commonwealth that have incrementally increased generating capacity since December 31, 1997, provided that such upgrades and improvements are necessary for the facilities to qualify as a Class I or Class II renewable energy generating source under section 11F of chapter 25A of the General Laws. 25 capacity expected to be needed to reliably serve the load to such load zone during the next subsequent auction after taking into account any delist or retirement bids that were rejected for reliability reasons, the department shall determine whether there is a need for additional electric generating capacity in the NEMA region. Such a demonstration shall be conclusive proof of the need for additional electric generating capacity in the NEMA load zone. 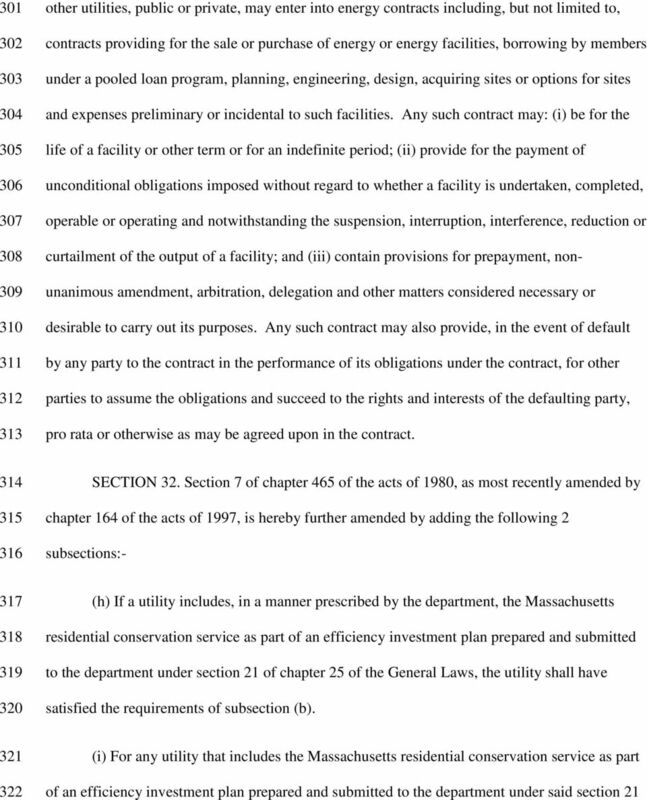 In making its determination, the department shall include consideration of ISO-New England findings and of the anticipated function of the capacity market in New England If the department determines there is need for additional electric generating capacity in the NEMA load zone within the next 10 years, under this section, the department may order distribution companies as defined in section 1 of chapter 164 of the General Laws serving such load zone to solicit competitive proposals from developers of electricity generation and provided reasonable proposals have been received, enter into cost-effective long-term contracts to deliver such resources to the NEMA load zone. If required by the department, each distribution company shall administer a competitive solicitation process in the form of an RFP for such capacity that would satisfy the criterion established in subsection (a) of section 21 of chapter 25 of the General Laws. The RFP shall seek a quantity of electric generating capacity sufficient to meet the shortfall identified by the department in the docket initiated under the preceding paragraph. Provided competitive proposals have been received, each distribution company shall enter into long-term contracts with a developer or developers of electricity generation resources sufficient to meet the shortfall; provided, that such contracts shall not be effective unless approved by the department of public utilities. 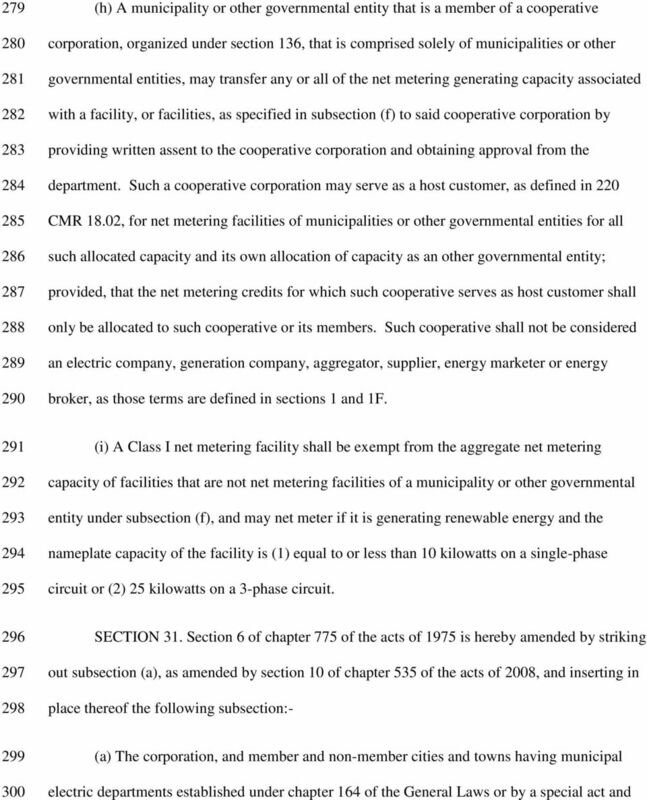 APPENDIX A: SYSTEM OF ASSURANCE OF NET METERING ELIGIBILITY Sections 1. Purpose... 1 2. Scope... 1 3. Definitions... 1 4. Obtaining a Cap Allocation... 3 5. Duties of the Administrator and Fees... 5 6. Chapter 52. Operation of Public Utilities. Article 7. Water and Wastewater Utilities. INTERNATIONAL MONTORO RESOURCES INC. (the "Company") STOCK OPTION PLAN. Unless otherwise defined, all capitalized terms are as defined below. CHAPTER 3: WHAT DOES MY COMPANY NEED TO DO TO COMPLY WITH THE CAP-AND-TRADE REGULATION?